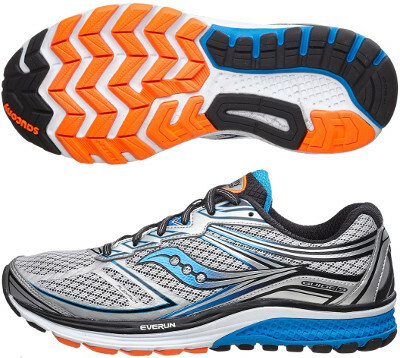 Saucony Guide 9 are stability cushioned running shoes. The Saucony Guide 9 has been released (along with the Triumph ISO 2 which also includes an extra heel pad) in the first wave of Saucony's running shoes with new EVERUN foam. It promises more responsiveness and durability than well known EVA but it is still unknown how it performs without feedback from unbiased runners. Anyway it is worth to try more plush cushioning combined with mild to moderate pronation control when going for mid/long distances and everyday workouts. Many elements changed from its predecessor the Guide 8. Upper is has been upgraded with an open mesh with FlexFilm™ overlays for lightweight, seamless feel which is taking over almost all models from american brand with a modern and attractive look. The other major change in the Guide 9 takes place in the midsole where new full-length EVERUN layer has been added on top (just below sockliner) for improved responsiveness and increased cushioning. SSL EVA has replaced PowerGrid™ as main foam in midsole and SRC Impact Zone extends into the midfoot for great shock absorption and fluid heel-to-toe transition. Medial post is in charge for pronation correction. Outsole has been completely redesigned as well with new TRI-FLEX configuration for improved flexibility and smoother ride. Materials remain unchanged using lightweight and flexible (IBR+) in the forefoot to enhance cushioning and responsive ride while more durable carbon rubber (XT-900) in more exposed areas to offer reliable traction even on wet paths.